The Martha’s Vineyard Detox Diet is the creation of Roni DeLuz who is the founder and director of the Martha’s Vineyard Holistic Retreat. DeLuz states that the program was originally designed with the purpose of cleansing and nourishing the body. Claims made for the health benefits of the diet are that it will cleanse the digestive system, boost immunity, reduce cellulite and enhance mental clarity. It also helps to change the way people think about food and to foster a new healthy lifestyle which can help with maintaining weight loss if these good habits are kept up. The substantial weight loss that occurs on the program DeLuz says is a bonus. However this is certainly the major attraction of the program to many dieters with promised results of 21 pounds in 21 days holding great appeal for those who are looking for fast results. The diet is centered on liquids such as fresh vegetable juices, live green drinks, berry drinks, herb tea and puréed vegetable soups. Permitted vegetables for soups include garlic, beans, carrots, cucumbers, celery, collard greens, kale, beets, sweet potatoes, summer squashes, most green vegetables, tomatoes, and purple cabbage. In addition there are several required nutritional supplements such as vitamins, digestive enzymes and aloe vera juice. These are the only foods to be consumed for the entire 21 day program. The plan provides a daily intake of approximately 1000 calories. Caffeine and alcohol must be strictly avoided. After 21 days dieters are encouraged to go off the detox diet carefully beginning with adding protein powder, soy milk, yogurt and salmon followed by gradually adding other nutritious foods. Dieters are advised to walk one mile a day in a quiet relaxed setting or to bounce on a mini trampoline for 20 minutes to help to stimulate the lymphatic system. Colonics, coffee enemas, saunas and lymphatic massage are recommended to help with eliminating toxins. 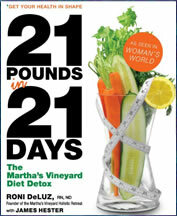 21 Pounds in 21 Days: Martha’s Vineyard Detox Diet retails for $24.95. However it is a requirement of the program to purchase nutritional supplements from the website which costs $199 plus $14.95 shipping and handling for the 21 day program. A juicer is also essential for the program and these can range in cost from $35-$500. May be beneficial for people at beginning of a lifestyle change as the dramatic change in routine can help to break unhealthy habits and to increase awareness about food quality in the diet. Rapid weight loss can be good psychological incentive for many dieters to continue with a weight loss program. High fruit and vegetable intake with an average of 22 serves daily. Only 20 grams of protein per day which is well below recommended daily intakes. Also lacking in essential fats and fiber. Withdrawal from coffee, sugar and alcohol can cause symptoms such as headaches which may make it may be difficult to continue with working and other normal daily routines. Socially disruptive as it is impossible to eat out for the entire 21 days unless bringing your own beverages. Requirement to purchase nutritional supplements as well as a juicer makes this a very expensive program compared to many other diets. Although dieters are almost guaranteed to lose large amounts of weight on this program it is likely that the majority of this will be muscle rather than fat loss. This in effect sets dieters up to regain weight when a normal diet is resumed due to a reduction in the metabolism. Current nutritional models in regard to detoxification diets are that such extreme approaches are unnecessary and may do more harm than good in many cases. If you want to cleanse the body and lose weight the best approach is considered to be a highly nutritious balanced diet. this sound like it would work… but only because your depriving your body of protein. when you get off the detox you’ll gain the weight back. I think this detox diet sounds great but its a little to expensive. I would like to try this. This diet is the basis for the most common type of detox, it works great because it keeps you satisfied with drinking every 2 hours. People should keep in mind that the point for this type of diet is to detox, which it does, and weight loss is only a side effect. I did it for 14 days, and lost 12 lbs, but I felt better than I had in years. I did the detox twice. The first time I lost 18 pounds in 21 days. I didn’t do all the additional items outside of the liquid meals and colonics, the base of the program. It was great and everything she said would happen in the book did. I have highly recommend the detox. I plan on completing 1-2 full 21 days twice a year and 3 days every quarter. Just bought the book and decided to return it after I looked through it. I thought it was something I could do on my own but you need to have colonics done by a professional, lymphatic massages done by a professional, use a chi machine, and many other things that probably cost quite a bit of money. it’s dumb i tried it just to humor myself and lasted barely a day because those drinks tasted horrible and after a while you crave solid food. You drink only liquids and still have to exercise? This Diet sounds good. Im going to try it and see if it works.